Since 3 of the most available bachelor and bachelorettes in the office (including moir) are leaving the company by end of this month and next month, we decided to do a farewell party, bbq style. The place? 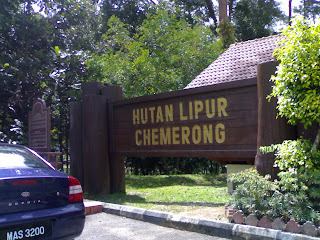 Hutan Lipur Chemerong with its famous waterfalls. So, all the single ladies and gentlemen (ada gak yg perasan single), and also Omar's family (Omar is the head of the trip, he decided to bring his family along) headed to Chemerong. The journey took bout an hour. It's located near Bandar Mukhtafi Billah. Gorgeous setting! Mandi and kena paksa mandi time! hehehe..It's lotsa fun whenever we are near the water....Sadly for me, I was having quite a fever and flue, so I can just rendam my feet in the cold water. Jeles sungguh tengok dorang main air...uhuks.. Nonetheless, it's a fun trip! I wish I could spend longer time with them. God knows when I'll be seeing them again. Already missing you guys! You guys are totally the coolest officemates on earth! hehe...find me kat menara tan & tan..